This article first appeared over the February to May 2014 issues of hi-end hifi magazine fairaudio.de of Germany. You can also read it here in its original German version for parts I, II and III. We publish its English translation in a mutual syndication arrangement with the publishers. As is customary for our own reviews, the writer's signature at review's end shows an e-mail address should you have questions or wish to send feedback. All images contained in this review are the property of fairaudio or the sources given - Ed. Plainly put, the various sectors of the hifi, recording and mastering industries arose only to address deficits. Listening straight to the source requires that musicians and audience occupy the same space at the same time. What began as the bridging of great distances via radio broadcast and rather basic music storage has, as we all well know, grown into multi-layered technologies and cultures which quite transcend the pure solving of problems. Over the decades, technical and creative solutions haven’t just been developed for our domestic playback pleasure but also for the recording side. Hence it should be interesting for hifi enthusiasts to learn a little bit about this other side. What had to happen so that Ella Fitzgerald’s warm motherly pipes, Motörhead’s crass attitude, Lorin Maazel’s finely tuned New York Philharmonic or the most current Pop star could make tracks to our ears? I dare imagine that once you’re done with this 3-part article, you’ll discover new facets in your favorite albums or perhaps hear them with entirely new ears. The start of the so-called record production chain is the music source itself. Hence the recording engineer’s work doesn’t begin with the microphone but ahead of it with the actual instruments. Fixing a number of issues after the fact can be avoided if a drum set is properly tuned first, an organ properly registered, the parameters of a guitar amp are adjusted differently or perhaps an instrument is swapped out entirely. Sometimes a €200 acoustic guitar suits a recording better than the costly vintage version with the boutique name. Acoustic, electroacoustic instruments and the wonderful human voice all depend on venue lest they turn blah. For many signals, the room in which they occur has a very dominant effect to require proper attention. This acoustic venue impact is very pronounced with electronic music and Jazz more so than with Pop/Rock productions. The precise positioning of a performer in the room—occasionally in different ones like percussion in the drum booth, guitars in the amp room—is an important aspect of the work. So is manipulation of these acoustics. Many studios rely on variable treatments, removable walls of different absorption or reflection coefficients or even large rotating wall modules to tune the acoustics. With large ensembles like symphony orchestras, this variability per venue is obviously limited. A choice of superior venue—the great hall of Amsterdam’s Concertgebouw, NYC’s Carnegie Hall or the Musikverein of Vienna—can contribute immensely. But obviously a good room alone doesn’t make for a good recording. Conforming with popular perception, one of the most important tools of the recording trade is the microphone. Here the singular term is à propos for the industry’s early days when all musicians huddled around a lone microphone to make relative distance from it and player technique the only variables. That approach had unassailable advantages but its sonic results and manipulative options don’t conform with today’s music consumer expectations. Today it is common to apply the single microphone scheme to individual sound sources. Now each becomes individually adjustable relative to all the others. But that’s a very general statement. Individual sections like woodwinds might share a microphone whilst an individual performer might get multiples. A common example is the bass drum in a drum set. Often one microphone is dedicated to the first-contact transient on the skin, another for the LF content which can cause subsequent woofer excursions in our domestic hifis. This game can escalate to four or more mics per bass drum. Snare drum, acoustic guitar and guitar amplifiers are other popular causes for multi-mic’ing. Different microphone types. Depending on gig and desired result (if the latter has actually been defined a priori), the sound technician’s job includes proper microphone selection. The number of available options is near endless since the market has veritably exploded over the last decade. 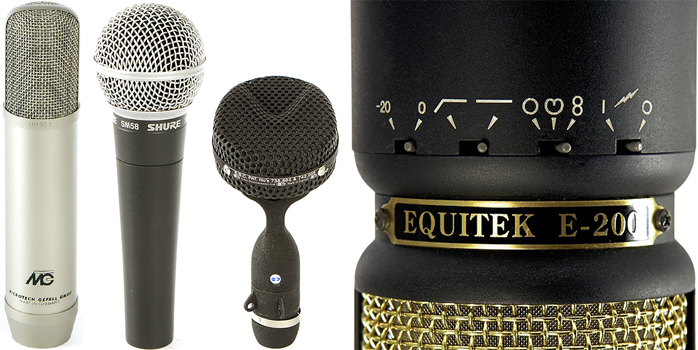 For our purposes we focus on key parameters which sort microphones into different types. There are only two regularly used systems which convert vibrations in the air into an analog voltage – which is a microphone’s job. Nearly all rely on a round thin foil which the sound waves trigger. In a dynamic microphone this moves an electrical conductor inside a magnetic field known as the 'generator principle'. Capsule construction of a condenser microphone. A hifi user looking closely at the construction of most so-called moving-coil microphones would note that the membrane, voice coil and magnetics aren’t that dissimilar from a dynamic loudspeaker. No surprise, the principle is identical and simply inverted. Hence with some microphones one can hear music when connected to a headphone (best not to try) and many speakers can record signal (actually done here and there). One of the most recognizable moving-coil microphones is the Shure SM58 with its signature ice-cream cone shape. Studios use the SM57 model more often but also a whole slew of similar designs with various attributes and abilities. In general moving-coil designs are liked for their low prices and reliability. Due to a copper voice coil that’s glued to their membranes, moving-coil mics are somewhat slow and often get dedicated to ‘coarser’ jobs like capturing speaker cabs of amplified guitars or percussion. A specialty category amongst dynamic microphones is the ribbon mic where an often just 1-2 micrometer thin elongated aluminium ribbon captures the sound. Due to their low mass, ribbon mics are faster but usually have very obvious sonic traits. Those aren’t always desired but in the right instance can produce a certain good-natured seamlessness. Where sonic neutrality and maximum detail are pursued, a condenser microphone of ½” Ǿ is a very common choice recognized by their typical stick shape. A thin membrane and solid back plate form the anode and cathode of the ‘condenser’. This capsule relies on a bias voltage which either is applied with an external supply (most often the 48-volt phantom feed of a microphone preamp) or permanently polarized with an electret material affixed to the solid back plate. This creates an excess of electrons on one end, a deficit on the other. As incoming sound moves the membrane relative to the back plate to alter their distance, it also alters the capsule’s capacitance, hence its voltage. These voltage swings track the diaphragm motion. That's how the movement of air molecules as the signal is captured. Incidentally the electrostatic loudspeaker exploits the same principle in reverse. Here variable voltage gets applied to a fixed condenser aka stator to cause a centrally placed membrane to oscillate and produce sound. 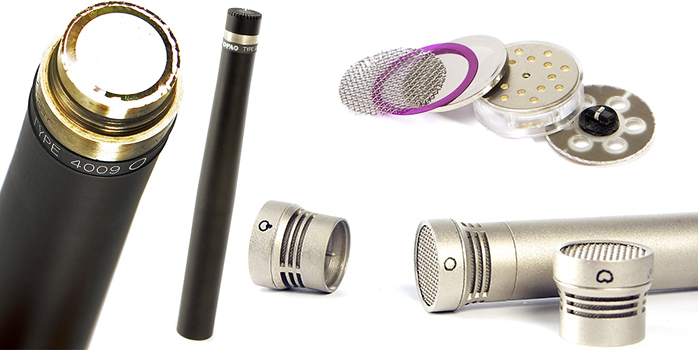 Condenser microphones can offer very linear broad bandwidth. Once membrane diameter exceeds an inch, one speaks of large-membrane condenser mics recognizable by their larger build and the fact that they don’t point at the sound source but are mostly used laterally. These are typical vocal mics which also get used elsewhere. One of the basic differences between large and small membrane condenser mics is that the former exhibit stronger personalities and sonic peculiarities like nonlinearities in their frequency response. 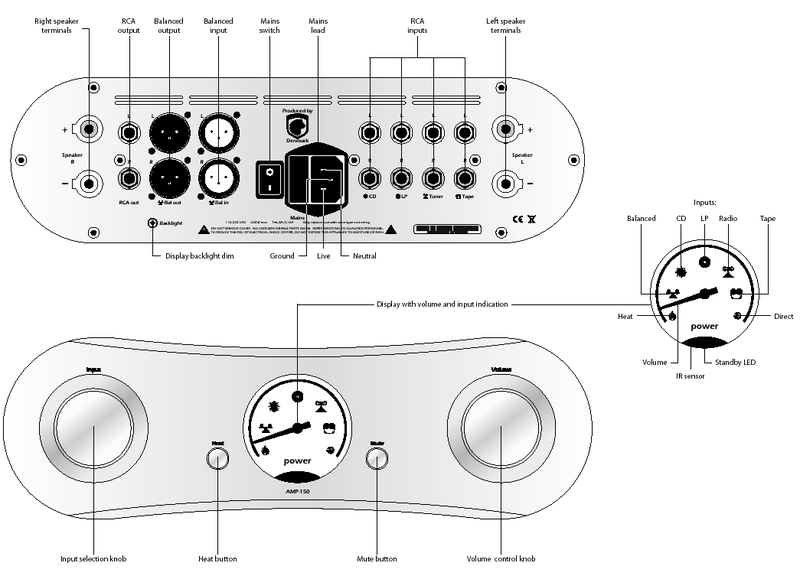 Aside from the actual capsule, it’s the following electronics (particularly if valves or transformers are involved) which create personality to often be used deliberately particularly with the large-membrane types. Sometimes it’s not naturalness which gets pursued. Most recorded bass drums sound markedly different in fact to how the actual drummer or their participating performers heard them in the performance venue.